Today was a day for doing maintenance. 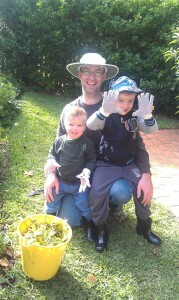 I started by doing some work in the veggie patch. There were some tomato plants that needed extra stakes, so I put them in. I also added some fertiliser to the tomatoes, as they’re starting to fruit and need to be fed. It was also time to give the contents of our compost bin a bit of a mix, as we’ve had it set up for a couple of weeks. After fixing up the garden, it was time for me to maintain myself. I went for the longest run I’ve ever done – 9.71km in 1 hour 8 minutes. It was one of my training sessions for the Bridge Run, and I was surprised how good I felt at the end of it. I maintained a nice steady pace, even after I had to stop and give a couple in a car directions after they asked. I’ve still some work to do to get my time down to under an hour for 9km, but I can see now that it is possible. All I need to do is maintain the training schedule and I’ll get there. I think I was a bit of a “runner’s high” at the end, thanks to the endorphins and I’ve got a better idea of why people get addicted to running. My knees aren’t so sure about this running caper though, and I think I’ll see a physio about them to see if there’s anything I can do to stop them getting sore while I’m running. Hopefully it will be an easy fix, and I can keep up the training. Back in February I wrote a post about the veggie patch that we put together. Today the boys and I did some work on it. 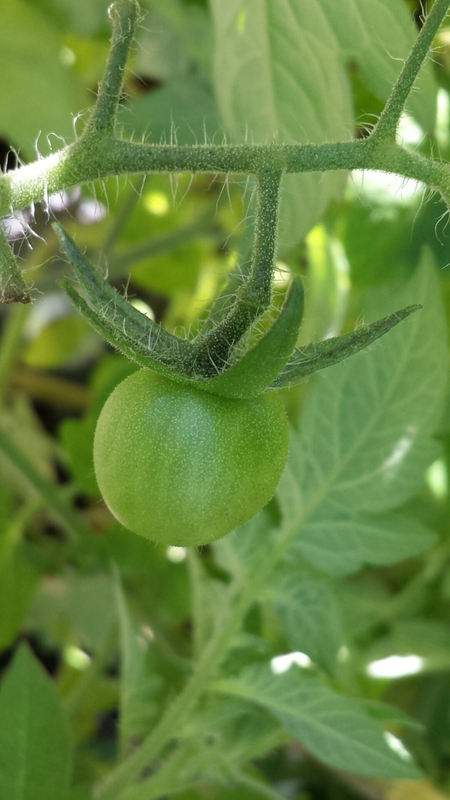 We tamed our tomato plants by tying them to stakes, and discovered that we’ve got some fruit developing! It’s nice to see that we’ve managed to get something out of the veggie patch. The rocket has been a success, but the cucumber plants ended up rotting and dying. The capsicums are still going, but I don’t know if we’re going to get any fruit off them. 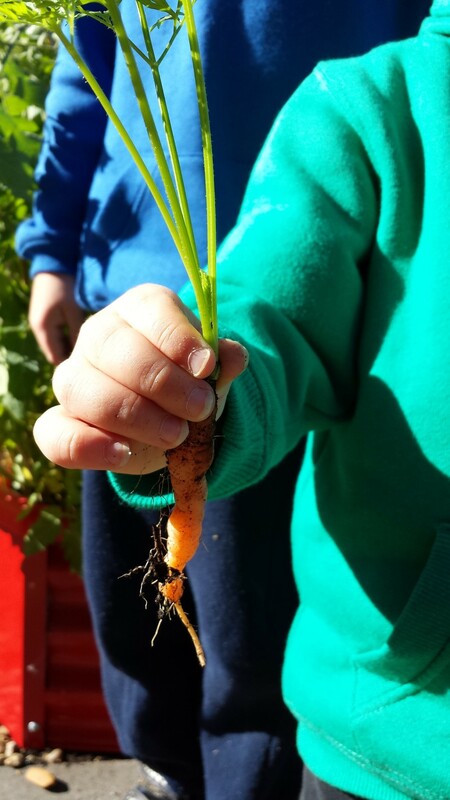 The other crop we planted was carrots, and we managed to keep one plant growing. Today was harvest day, so Tom carefully pulled it out of the ground. The carrot was about 5cm long and a bit skinny and knobbly, but it tasted OK.
Hopefully the stakes will keep the tomato plants happy, and we’ll get a nice crop out of them. There are a few tiny fruit starting to develop, so we’ll keep an eye on them and try and harvest them before the bugs or the birds find them. Our second job for the morning was to fill our new compost bin. We received this for free from our council as part of a composting and worm farming workshop which I attended a couple of weeks ago. I’d been meaning to buy one, so it was a nice bonus to get one for free. 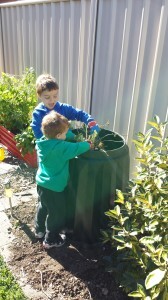 The boys helped me fill it with some sticks and green leaves. It’s in a fairly sunny spot in the garden, so hopefully it will get warm enough to get the bugs and microbes working. Now all we need to do is remember to add our veggie scraps to it. I’m looking forward to having some home-made compost to use around the garden in a couple of months time. My wife and I had decided a couple of weeks ago that today was the day that we would wash our house, as part of our preparation for selling it. It was on the calendar, so it had to be done. We saw the weather forecast and knew that it would be raining, but figured that we’d probably be getting wet doing the cleaning, so a bit more water from the rain wouldn’t be a problem. The weather in the morning was pretty good, as the rain held off while we had the high-pressure cleaner and hoses and brushes out. There was even a little bit of sun. It was a productive few hours, with Dad working on cleaning the back of the house with my wife and I out the front. I don’t think the house has ever looked cleaner – it’s almost a shame to be selling it. After lunch we switched our attention to the garden. We had some rosemary and daisies that we wanted to put into pots, and mulch to spread on the garden beds to make them look neat. The rain started to come down a bit steadier in the afternoon. We got most of our jobs done, but there’s still a few little things to be done. It was nice to have a warm shower when we were done, before we went and collected the boys from Grandma. The outside of the house and the garden are looking good, so now most of our remaining work needs to be done inside. This should be easier to do, as we can work on things at night once the boys are in bed. We’re working through our to-do list pretty steadily, so we can see the end approaching. 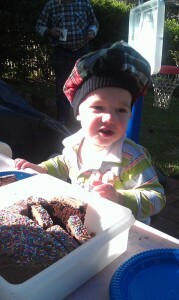 We’ve had a busy and productive long weekend at our place. 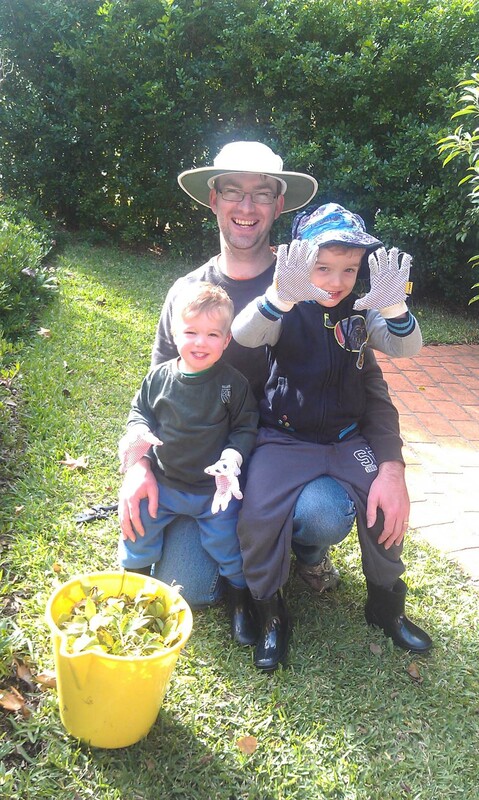 In preparation for selling our house we had a bit of a working bee to get the garden tidied up and looking presentable. I made a start on Saturday by trimming the hedge and pruning the roses. 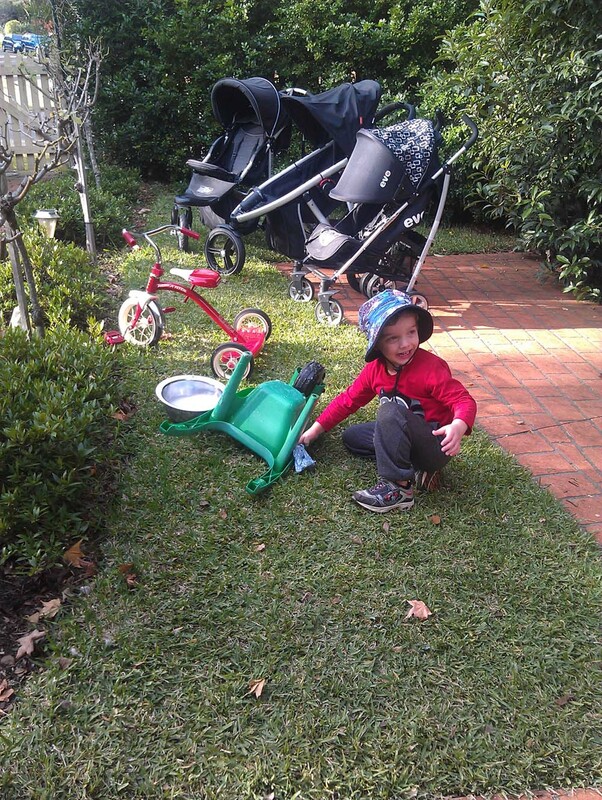 I had a couple of helpers too, who did their bit to try and tidy up. Yesterday it was all hands on deck. My parents came over yesterday to help in the garden and to be an extra couple of pairs of eyes and hands to watch the boys and keep them out of trouble. We managed to get quite a bit done, and you could certainly notice the difference in the appearance of the garden. 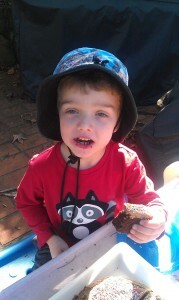 Grandma’s chocolate cake was certainly a hit with the boys. We also took the opportunity to clean the pram and stroller, as well as the pram that we’ll be giving away to the Dandelion Support Network. 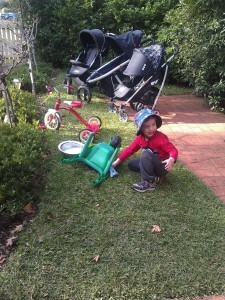 Thomas also thought it would be a good idea to clean his wheelbarrow. I think you missed a spot! Dad came over today to do a bit more work, and we managed to lop some dead branches off the trees near our driveway, and finish the pruning of some other trees around the place. There’s still a bit of work to do around the back of the house (which Dad is planning to work on tomorrow if the weather’s OK), but the front yard is looking much better. All we have to do now is keep it looking that way, until we’re ready to sell.